Why is it prohibited to sleep in a tent? In many European countries like Germany, it's prohibited to sleep in the great outdoors with a tent. While I understand that downright camps are a problem due to littering, fire etc., I don't get why a tent is a problem. Like what's the difference anyway if one is sleeping in the open air and in the tent? The tent just makes your intent obvious: You planned to sleep there from the beginning. And this is what the authorities want to prevent: Camping in the wild. On the other hand many legislations allow for emergency and high altitude bivouacs, which are inevitable. So the gray area developed where people sleep without a tent in order to escape punishment, as they are just bivouacking. In popular climbing areas in Switzerland they also fine you for bivouacking, as an emergency is clearly not the case (usually people carry stoves and more food/drink than you would "expedition style"). So usually the distinction is planned/unplanned sleeping out in the wild, and often this has been adopted to sleeping with/without a tent, even though the two are certainly not equivalent. Another reason why bivouac is favored over tent: Bivouacking is associated with trekking lightweight, in which case you do not take stuff to throw away (that would be useless weight). So the potential for littering is generally smaller in bivouacking. Due to the interest this question has spawned and some comments, I informed myself about the laws here in Switzerland regarding this issue. Somewhat surprisingly on a national level Switzerland knows a "Jedermannsrecht": Article 699 of the ZGB (civil law) states that access to forest and meadow within the locally common extent is allowed to everyone. Fishing and hunting is excluded from this and regulated on the level of "Kantone". This is even more explicit in article 14 of WaG (laws concerning forest): "Kantone" have to make sure that the public can access forests. Again restricted locally to preserve nature and events need approval from authorities. Of course this is restricted by further laws about conservation areas, but it should be common place that in any kind of conservation area (there are lots of different kinds around here...), you have to inform yourself whether its allowed or not and in doubt, you don't. So one might think "Why all this fuss about whether you can camp or not in the wild, this says you can...". The problem lies in the details, which in this case is the access up to "locally common extent". As Switzerland is based on federality, meaning very strong independence of the "Kantone" and of municipalities, they can basically all choose what they consider "common extent". So basically in Switzerland you either ask in every municipality whether you are allowed to or not or you adhere to commonplace rules and the so called eleventh law: Don't get caught. Still I was not aware about the extent of legal backing for free access to woods around here: Basically you cannot fence any forest area even if you own it privately, as access to the public is granted (and walking through it is the basic kind of access, so you can't exclude it as "locally uncommon"). I don't know whether this will help anyone, I just felt like writing it down. It's not really about the tent, it is about planned "bivouacs" (that means you plan to sleep outdoors) and emergency bivouacs where the latter of course aren't forbidden. That means if you carry a tent and sleep in it, it was obviously planned to sleep outdoors where people possibly do harm to the nature because they generally don't follow the Leave No Trace principles. Still if you don't carry a tent (but e.g. a sleeping pad and bag) this is somehow a gray area in the law of most European countries. See other threads like e.g. this. In Central Europe there is a much higher population density as e.g. in many parts of the USA, Canada or Scandinavia. There is almost no valley without a village. So private property is rather rare and the land owner want to protect it. In Austria there had even been a law from 1852 (Reichsforstgesetz), which prohibited entering the forest completely. Not even hiking was allowed. The forest was mainly owned by a few great land owners (nobility). It was used for hunting and forestry. It took until 1975 when the law was renewed (Forstgesetz). Now everyone was allowed to enter the woods for recreational purpose. But only what was considered as "walking". That includes ski touring, but not mountain biking (that was not known back then). As the forest roads are considered as part of the forest mountain biking is not even allowed on these roads. Exceptions are regions where mountain biking is of importance for tourism. Grasslands usually belong to farmers. Usually they also don't want you to camp on their land. Land owners have quite a strong lobby here and they want to protect their property and the law. Currently there is a discussion about legalizing mountain biking. But I think there are not so many people here who want to camp in the great outdoors that there will be some movement in this direction. Even tourism prefers to fill hotels. I read that there are exceptions in the alpine wasteland above timberline. But it depends on local laws of the federal states. Population density Germany: 228 pop/km2; US: 33. Much of the land is simply privately owned. Most surface area (public or private) is used one way or another (residential, forestry, agriculture): There is no "wild" or "great outdoors" in Germany with the exception of a few National Parks (Alps, Oder, Bavarian Forest, among others) which are regulated just like in the States. The primary focus there is on preservation (from use and degradation through human activities, to be blunt), not on recreation. These laws are often to stop homeless people hanging around. In England the vagrancy act has not been repealed and the police still arbitrarily arrest people for being vagrant. So even sleeping rough without a tent is illegal. In other places they just want to extract as much money from tourists as possible and to make them use official facilities. In Scotland wild camping is allowed. Pedestrians can also camp near roads. Car drivers have to walk away. There are limits around Loch Lomond due to tourists leaving rubbish. 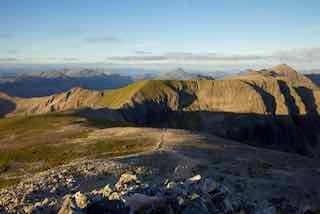 Summit of Beinn Eighe with wild camping tent (green). In England it is not allowed anywhere apart from a small patch of Dartmoor. Anywhere there is too much population and people would jump on the tent. A couple of weeks ago a homeless man in Manchester was murdered in his tent. In England you can camp in the Lake District out of view. In France wild camping is not allowed officially but I often camp in the Pyrenees. 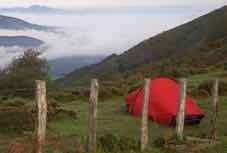 In the National Parks there are "Aire de Bivouac" where you can camp with the tent up from evening to morning. Many of the refuges allow camping nearby too. In Spain wild camping is not allowed but the Spanish are very relaxed about their laws. I did the GR11 across the Pyrenees and had no trouble camping all the way but a few times I chose to stay in an official campsite or refuge to get food and a shower. One day I asked someone for water and they invited me in and gave me wine and food and let me camp in their field outside. There are areas where camping is allowed above a certain height. GR11: Spain viewed from France with wild camping tent (red). Camping means 'zelten' in German, 'Zelt' means tent. "Zelten verboten!" means no camping, even without a tent. I am in western Canada, in the province of Alberta. I would not presume to cross fenced land without asking. But unfenced land is considered open. Much of the land near streams is crown land -- and that is open for reasonable use either walking or camping. Many provincial parks are open year round and allow either car camping or tenting with minimal fees. I often camped at Two O'Clock Creek campground on the shores of Abraham Lake on my way from Edmonton to Lake Louise ski resort. In winter I was the sole occupant to the camp. The Navigation Act allows camping within 12 meters of mean high water on all navigable streams for any party that is traveling along the stream. Some years ago I did a 3 week canoe trip from Forrest Lake on the upper reaches of the Clearwater River in Saskatchewan, down the Clearwater, up the Mirror, then down the MacFarlane finishing at Fort Smith. During that time we saw 1 other party, a motor boat across about 3 miles of water on Lake Athabasca. On other trips, not only were we the only people present, but despite diligent research we were unable to locate records of anyone having done the route since the Canadian Geological Survey traveled them 50 to 100 years before. In a few cases, I have made a plausible case that no one had gazed on a particular vista since the ice left 10,000 years ago. Population densities in Canada are low: We have 35 million people on 10 million square km. Most of the people live within 150 km of the US border. Compared to Europe, I think that a greater fraction of people live in cities rather than villages and smaller towns. If you look at a map of Canada you will see a chain of large lakes running from the Great Lakes to the northwest to Great Bear Lake. North of this line is the Precambrian Shield -- a mass of ancient granite. This entire area, some 2/3 of the country, is unsuited for agriculture or forestry, and makes for difficult road building. (Rocks and swamp) Mining is significant, as is tourism. So yes, we have very large quantities of not very much, and (so far) don't need these rules. Not the answer you're looking for? Browse other questions tagged wild-camping legality europe or ask your own question. Am I allowed to “wild-camp” in my car? Stuff or roll a tent for storage? Why aren't there any electric stoves that can be used for cooking where you can't build a fire? Why do I always wake up freezing?